Review: Wrap Conversion Fly Tai – for the Win! 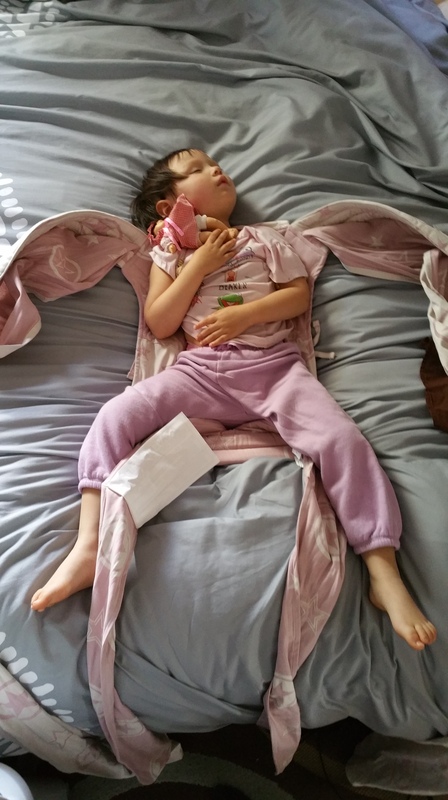 Persian Paisley FlyTai with a 30 lb napping toddler. Passed the test. As always, the folks at 5 Minute recess sent me something totally awesome and budget friendly to review. This time it was one of Fidella’s new Wrap Conversion Meh Dai’s, called the FlyTai. I ended up liking the tester so much that I ordered a few for our local carrier Learning Library. Besides fitting nicely into the budget range just under $120 it is also a great option for those seeking to make a carrier purchase that will truly grow with their child. The FlyTai has many features that I find appealing in a Wrap Style Meh Dai. The straps are lightly padded to wrap style, giving you some extra cush without too much bulk. 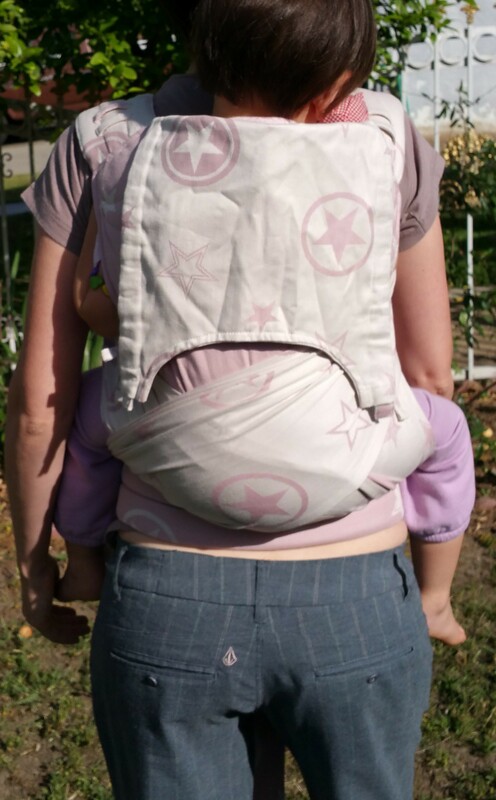 Then you get the added benefit of better weight distribution by being able to spread the wide fabric straps across your body while wearing the carrier. This proved to be a real selling point when wearing it with my 30 lb. 3 year old. Although her legs definitely exceeded the width of the seat pretty far, I was able to better support her little pony legs with the wrap straps, giving her a very ergonomic seat which in turn gave me a more comfortable carry. 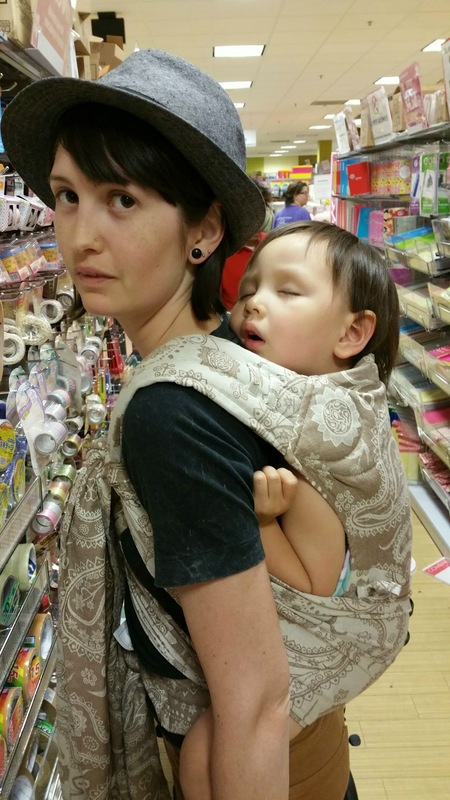 I walked around a mall with her snoring on my back for the better part of an hour… and you all know what a napping toddler feels like – 30 lbs of dead weight strapped to me for that long… and I did not regret it one bit the next day. 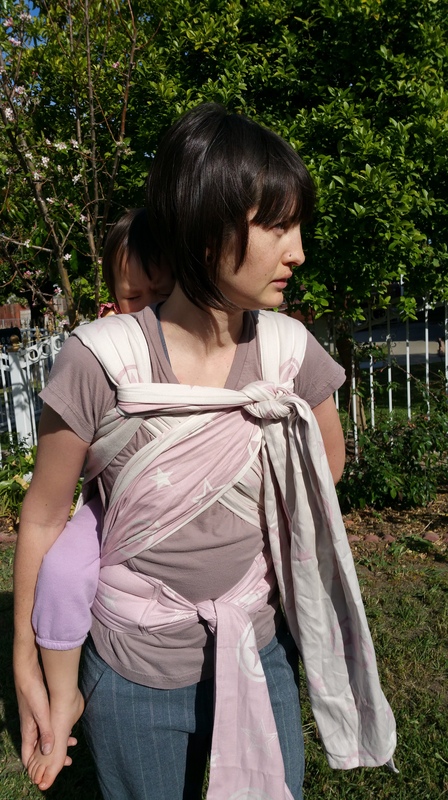 I also had enough length with the 78” straps that I was able to spread them across my chest to finish which gave me even more toddler support. I love wrap style straps! The waistband is lightly padded and fairly wide, it molded to my body perfectly and did not create any pressure points or awkward fit issues in the waist region (to put it politely). I was able to get a nice snug fit as petite wearer, without any overlap of the padding where I tied the carrier at my waist. There was plenty of length for the waist straps, they measured 72” from one end to the other. That with the generous width of the band would make it a great fit for a larger wearer too! My favorite feature of the FlyTai, is the 4 way adjustability of the carrier. There are places to cinch the carrier on all four sides of the body panel, so you have the ability to make the seat narrower and the height of the panel shorter to fit a smaller baby. Not only was the carrier a pretty decent fit with my own giant toddler, but I was able to get a great fit with my friends’ 3 month old too! Though other Wrap Conversion Meh Dai’s like the DidyTai have a place to adjust the carrier at the bottom to make it narrower, I liked the aesthetics of the Fly Tai’s adjustment much better, and they include the ability to adjust for height in the panel too – which is not something you see in the more commonly available Wrap Style Meh Dai’s. The height can be adjusted from 9.4″ – 18.9″ and the width from 4.5″ – 15.7″making it appropriate to wear with your newborn, and to keep fitting comfortably until you max out the upper weight limit at the manufacturer recommended 33 lbs. The 4 way adjustment is by far my favorite feature of the FlyTai, though it contributes to one of the only faults I found with the carrier. When you adjust the width of the base of the carrier to its most narrow setting, it causes some unsightly “puckering” right at the place where the body panel meets the waistband. This kind of cosmetic thing is pretty inescapable when you combine this level of adjustment with a wide padded waistband, but nonetheless it is something I feel the need to point out. The good news, was I was able to cover that part of the carrier with the straps when they were spread out, so it was not visible to others. More importantly, it did not cause any discomfort around my waist at all. It did not detract from my overall satisfaction with the carrier. The flat hood is really simple and it’s fully adjustable as well. It does a great job of showcasing the patterns of the lovely organic cotton Woven Wraps Fidella is known for. The shoulder straps have attached loops to thread the strings of the hood through, which can prove to be a little tricky in a back carry, but definitely doable. When you cinch the width at the top of the carrier, it makes the hood look like your baby’s own little Superhero Cape, which is kind of amazing. I don’t know if it was intentional, but it sure is adorable. Just like all the Fidella wraps and ring slings, this FlyTai came out of the package deliciously soft and silky to the touch. A little too silky actually. I was having a really hard time getting the passes tight enough with my giant toddler at first, because there was so much glide in the fabric. I kept tightening and tightening, and it kept slipping again. The problem was solved when I gave it a wash (I know, I know… cardinal rule) at which point it fluffed up even nicer, and it developed much more grip once the fibers were roughed up a little bit. The next time around it was way easier to tighten and to keep the passes in place. I haven’t even mentioned the prints! Fidella has some lovely designs available. I personally always gravitate towards the more elegant prints like the Iced Butterfly, but the Outer Space and Rock n Rolla prints are very Daddy friendly, and the Sherba print is so, so much fun. They have a nice cross-section of patterns to appeal to many different tastes. What a win for this lovely German budget line. I appreciate the economic accessibility they are bringing to an otherwise rather expensive category of baby carrier. With all the new regulations making custom Wrap Conversion Meh Dai’s harder and harder to get a hold of in the states, I expect that these FlyTai’s are going to keep Flying off of the shelves! (ha ha ha, couldn’t help myself) Well deserved though, I have to say I have been impressed with everything Fidella has brought to the table. I have been researching mei tai wraps and came across your post. 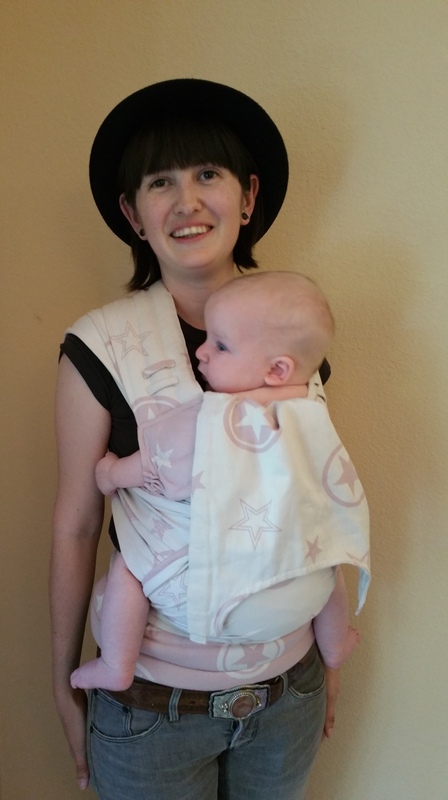 I am petite also (5’6″ at 109lbs) and find the buckle carriers (ergo) really uncomfortable but loved my Moby wrap. I was going to go with a babyhawk but I think this one is more versatile as your baby grows – just what I am looking for. I am glad I came across your review.